ESA's new small telecom platform was launched on its first mission in the early hours of this morning. The Hispasat 36W-1 satellite, based on the SmallGEO platform, lifted off on a Soyuz rocket at 01:03 GMT this morning from Europe's Spaceport in Kourou, French Guiana. SmallGEO is Europe's response to the market demand for more flexible, modular telecommunications platforms. 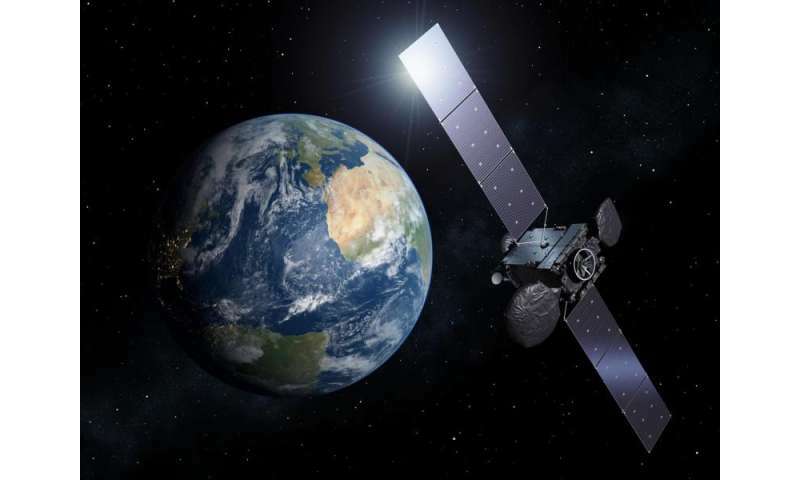 It marks the first time the German satellite manufacturing company OHB System AG have been the prime contractor for a telecommunications satellite mission. Its Hispasat payload marks the first ESA partnership with a Spanish operator. It is heading towards 'geostationary' orbit at an altitude of 36 000 km over the equator, where it will take a day to circle Earth and therefore appear to hang over the same point, in this case at 36°W over the Atlantic Ocean. OHB will test the satellite's health and performance, making sure the sensitive technology made it unscathed through the violence of the launch. "The launch of this first SmallGEO platform marks another major success for ESA's programme of Advanced Research in Telecommunications Systems, known as ARTES, which aims to boost the competitiveness of its Member State industry through innovation," noted Magali Vaissiere, ESA's Director of Telecommunications and Integrated Applications. "SmallGEO is part of our continuous efforts to strengthen the position of European and Canadian industry in the commercial telecommunications market, expanding the current range of available products. "The next satellite based on SmallGEO will be EDRS-C, as the second node to the European Data Relay System." Carlos Espinós Gómez, CEO of Hispasat, said: "For Hispasat, this new satellite represents an important step forward in its innovation strategy. "Hispasat 36W-1 is not only the first mission of the new SmallGEO platform, but also incorporates an advanced regenerative payload that will provide the satellite with greater flexibility and signal quality thanks to its reconfigurable antenna and onboard processor, thus improving the telecommunications services it will provide to our clients. "We are very satisfied with our collaboration with ESA, which has allowed us to participate in a leading technological project to which they have added significant value with their knowledge and experience in the space sector." Marco Fuchs, CEO of OHB System AG, commented: "The launch is a major milestone in the history of OHB. Hispasat 36W-1 proves that OHB's concept of a modular and flexible SmallGEO platform fits into the market. "SmallGEO is destined to build a cornerstone for Europe's future activities in the segment of geostationary satellites in the three-tonne class. "For OHB, Hispasat 36W-1 is the first project of a wide scope of future missions based on the SmallGEO platform, including a revolution in satellite technology: the full electric propulsion mission Electra."